Have you been looking for the right ways to optimize your ads? Do you think your ads are not performing up to the mark? There are many performance based queries which might arise in your mind when you analyze the metrics of your Facebook adverts performance. Facebook is a goldmine for those who know how to use it the right way. If you are not doing it right, you are losing money on your ads. So, how to do it the right way? Right audience targeting: Are you targeting those who might be interested in your product or service? Apt Facebook ad objective: Have you selected the best ad objective for your promotion? Attractive ad copy: Is your ad copy persuasive enough to attract and engage your audience? No matter what you are promoting, if you can find the right audience and reach them with an attractive and persuasive ad copy then you can reap the benefits out of it. In this article, we are going to discuss in detail about the Facebook ad objectives which you can choose from. Also, we will learn how to decide the best ad objective for your Facebook ad campaign. Awareness: When you want to make your targeted audience aware of your products or service, this is the category to go for. Consideration: This is the stage of the buyer journey in which the buyer is thinking about purchasing a product or service. This is the stage when the buyer is considering all the options. Conversion: This is the final stage of the buyer journey in which you have to convert the user. Depending upon the type of the promotion you want to do, you will have to choose the ad objectives. As of now, there are total fifteen ad objectives divided into these three stages of buyer journey. Let us understand each of them in detail. When you want your audience to engage (like, react, share or comment) with your ad, then you run a PPE ad or post engagement ad. This is nothing but boosting your post to reach a wider range of audience. You can boost most of the posts on your page from status to photo, video, carousal, slide-show, article etc. The boosted posts appear higher in the news feed of your audience and are labeled sponsored. The boosted posts are not shown in the Facebook right column. You can boost the posts on Facebook as well as Instagram. Example: Let’s say you have written a new article and you want more people to engage with it, then you can boost the post so that it reaches higher number of users on Facebook. How am I charged when I run a Facebook post engagement or PPE ad? When you run an engagement ad, either you pay by engagement or by impressions. It also depends upon your optimization for advert delivery method. If you choose the ‘Post engagement’ as your optimization method then you will have to pay either by Post engagement or by Impressions. You will have to select anyone of the two in the ‘When you are charged’ option. If you choose the ‘Impressions’ or ‘Daily unique reach’ as your optimization method, then you will be charged by Impressions. When you want to promote your page and increase the number of likes on your page then you select the ‘Page Likes’ ad objective. In this Facebook ad objective your method of optimization for advert delivery is Page likes and you are charged by Impressions. Example: If you have recently launched your business and want your target group to know about your business and like your page, then you can run the ad using this objective. This Facebook ad objective is for those who want to target users nearby their business. Also, you can create a single ad for multiple locations of your business. The type of ad formats you can choose for this ad objective are photo, carousel, video and slide show. The ads can be shown on Facebook as well as Instagram. Learn more: The users who see your ad will be able to click on the button and go on your directed page. Send a message: The users who see your ad will be able click on the button and start a conversation with you directly. Get directions: The users who see your ad will be able to click on the button and get directions to your business location. Call now: The users who see your ad will be able to call your business directly from Facebook. Example: Let’s say you have opened a new store in a particular area and you want nearby people to know about your products or offers. In this case, you can run a local awareness ad. This Facebook ad objective allows you to make people aware about your brand who might be interested in your product or services. Facebook automatically shows the brand awareness ads to those who might pay attention to the advert. Call to action buttons can not be shown in the canvas ad format. The brand awareness adverts are only shown in Facebook and Instagram news feed. Other ad placements are ineligible for this ad objective. The brand awareness ad objective is optimized for either Brand awareness or for reach. In both the cases, you are charged for Impressions (CPM). Example: Let’s say you have recently launched your e-commerce store and want people to know about your designer collection, then you can run a carousal ad for some of your products. You may keep Shop now as the call to action button in this case. As the name signifies, this Facebook ad objective focuses on showing your ad to maximum number of people in your audience. The different ad formats for the reach objective are photo, video, carousal and slide show. 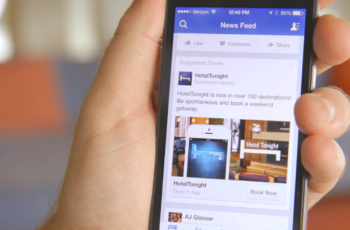 The ads in this ad objective will be shown to your users on Facebook and Instagram in only the news feed section. For this ad objective, there are two methods of optimization for advert delivery: Reach & Impressions. No matter which method you select, you will be charged based on the ad impressions. Example: Let’s say you have created something innovative and you want maximum people to know about your product, then you can choose for this ad objective. Website clicks ad objective is used for sending traffic to your website or any page where you want to redirect your users. The ads of this objective can be shown on Facebook, Instagram, audience network as well as Facebook messenger. Also, the ads of the website clicks ad objective would be shown in news feed as well as the right column of the Facebook. The ads will be shown in the instant articles too. The ad formats eligible in this ad objective are photo, video, slide show, carousel and canvas. For this ad objective, there are three options to choose from when you to decide the optimization method for advert delivery. They are link clicks, impressions and unique reach. When you select the link clicks as the optimization method, you are charged per link click (CPC). In the case of Impressions and Unique reach, you are charged as per the impressions (CPM). Example: You have created a new landing page for one of the services of your company and want to drive traffic to that landing page, in that case you may use the website clicks ad objective. App installs ad objective is used to encourage the people who view your ad install the application in their mobile devices and Amazon fire tablets. When you select this ad objective, you can show the ads on Facebook & Instagram news feed and in instant articles. The ad formats which are eligible to be promoted in this ad objective are photo, video, carousal and slide show. The ads redirect the user to either Apple store or Google play store. For the app installs ad objective, you can choose from four options for the optimization for advert delivery, namely app installs, link clicks, app events & video views. When you choose the app installs as the optimization method, then you are charged by impressions or app installs. When you select the link clicks to be the optimization method, then you are charged on the basis of either link clicks or impressions. On selecting app events as the optimization method, you pay by impressions (CPM). When you choose video views as the optimization method, then you are charged either by impressions or by 10-second video views. Example: You can run this ad when you want your target audience to install your ad in their mobile devices. This ad objective is used for making people see and respond to your events. The ads of this ad objective are eligible to show only in the Facebook news feed and right column. For this Facebook ad objective, four methods of optimization for advert delivery are available, namely event response, impressions, post engagement and daily unique reach. When you select event response as the method of optimization for advert delivery, you are charged by impressions (CPM). When you opt for impressions as the optimization method, then also you are charged based on impressions (CPM). For the post engagement method, you are charged by post engagements (PPE) and for daily unique reach, you are charged by impressions. Example: You can run this ad for promoting your events. You can also exclude those who have already responded to your event. Video views ad objective allows you to promote your video content to the right people who might be interested in viewing this type of content. The ads of this ad objective are eligible to be shown on Facebook, Instagram as well as Audience network of Facebook. On Facebook, the video would be shown in the news feed, right column and instant articles. In this Facebook ad objective, two options are available for optimization for advert delivery namely video views and daily unique reach. For both the methods you will be charged based on the impressions (CPM). Tip: If you are running video views ad, the real prospects would be those who have seen 75% or more of your video. Thus, for analyzing the result, count the success rate by the above mentioned metric. Example: Video views are a great way to engage your audience as everybody likes to watch things in motion. You can run the video advert campaigns for launching your new product or feature. As the names suggests, this ad objective is used for driving more sales or gathering leads information from the people who might be interested in your business. The ads of this objective are shown only in the Facebook news feed. The ad formats which can be used for lead generation ad objective are photo, video, carousal and slide show. You might be wondering how the lead generation campaigns work. It’s easy. Basically, you create a form for your users to fill out the information. When they click on your ad, the form opens in a small pop-up and asks the user to fill in the information. You can easily download the information in a sheet or sync the leads with your CRM such as Salesforce and Mailchimp. Photo, video, carousal and slide show are the ad formats which you can use in this ad objective. There are two methods of optimization for advert delivery namely leads and link clicks. When you choose leads as the optimization method, you are charged by impressions (CPM). When you go for link clicks as the optimization method, then you are charged by link clicks (CPC). Example: Let’s say you want to gather the information of the people who might be interested in buying your brand new product, then you can run ads using the lead generation ad objective. The website conversion ads are by default shown on all the devices and Facebook news feed, right column as well as instant articles. The ads are also shown on Instagram and audience network. There are four methods of optimization for advert delivery in this ad objective. They are conversions, impressions, link clicks and daily unique reach. When you choose conversions as the optimization method, you will be charged by impressions (CPM). For impressions method of optimization, you are charged by impressions only. When you choose the optimization method to be link clicks then you pay either by impressions or by link clicks. For the daily unique reach method, you are charged by impressions (CPM). Tip: If you are promoting any e-commerce product, then it is advisable to select either the purchase event or add to basket event. The reason behind this is that Facebook shows your audience to those who are the right people for your chosen conversion event. If you select the conversion event to be Add to basket, then your ad would be mostly shown to those who might add to cart. Similarly, for purchase event, your ads would be shown to those who are likely to purchase. App engagement ad objective is for those who want to increase engagement on their applications. This is mainly for targeting the existing customers. These ads are only shown in the Facebook news feed and right column. The ad formats for this ad objective are photo, video, carousel and slide show. In this ad objective, there are three methods for optimization for advert delivery. They are engaged users, post engagement and daily unique reach. When you choose for the optimization method engaged users you are charged by impressions. When you select post engagement as the optimization method, then you are charged either by impressions or by post engagement. When you select the daily unique reach method, you are charged by impressions. Example: Let’s say you have a travel app and you want to show relevant deals on hotel bookings to your existing users, then you can run the ad with a call to action book now. You can use the offer claims ad objective for promoting your new offer to your target users. When you create the offer claims ad, you will have to first create an offer and set the pixel for the tracking and re-marketing. The optimization for advert delivery can be done by three methods namely link clicks, conversions and post engagement. When you choose the Link clicks method, then you are charged either by impressions or by link clicks (CPC). If you select conversions as the optimization for advert delivery method, then you are charged by impressions. If you select post engagement then you are charged either by impression or by post engagement. 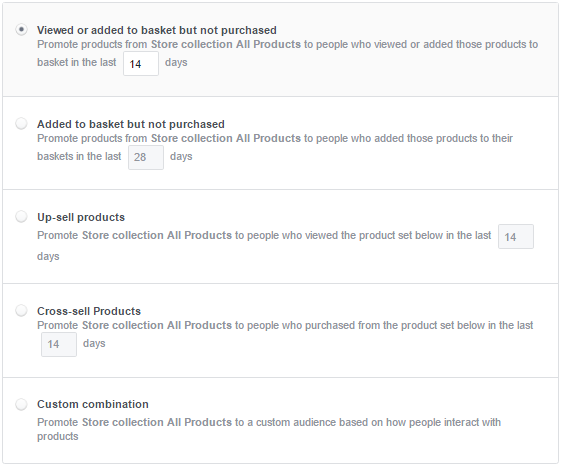 Using this Facebook ad objective, you can show your products in the product catalog form to your target audience. In this ad objective, you define a custom audience by choosing one of the given options (as shown in the given image). The ad formats allowed in this ad objective are photo and carousal formats. The adverts are shown to users in the Facebook news feed, Facebook right column, Instagram and audience network. The optimization methods for advert delivery for this Facebook ad objective are link clicks, impressions and conversion events. When you select Link clicks as the optimization method then you are charged either by impressions or by link clicks. For the impressions method, you pay by impressions. And, when you select the conversion events method, you are charged by impressions. Note: For the conversion events, you will have to select the events. The events from which you can select are Purchase event, Add to basket event and Complete registration event. Example: If you want to promote new products or cross-sells to your users, then this is the ad objective for you. You can also use the product catalog sales ad objective for re-marketing to the users. Store visits objective is used for bringing the people to your physical store. Those who are nearby your business location can be targeted using this objective but is not necessary. You can show ads to anybody who might show interest in buying from your store. The ads of this format are only shown on Facebook. Also, the ad formats which are eligible to shown in this ad objective are photo, carousal, video and slide show. The call to action buttons for store visits are get directions or call now. No matter which type of business you run, it is very easy to run an ad on Facebook and engage your audiences. You just need to get the audience, ad objective, pixel and ad copy right. If you have an e-commerce store, then we suggest you to read this article on 11 proven ways to optimize your Facebook ads for your e-commerce store . If you have any queries regarding the Facebook ad objectives, let us know in the comments and we would be happy to help.